A well-rounded way to relieve your post-workout soreness. This massage roller ball combines foam rolling and icing therapy into a single sphere, so you can soothe your sore muscles at home. Leave it in the freezer—the gel interior stays cold up to six hours—so you can relax any ache, inflammation, or spasm one roll at a time. This seems to work well! It is really cold. Good for massaging sore muscles. Best device tried for icing and post exercise. Great also for plantar fasciitis. Stays cold for hours. Easy to use and love that stays cold for several hours. Really helps with back and foot. Use this American made massage roller ball to get the benefits of foam rolling and icing—for a well-rounded, muscle-relaxing therapy. It works a lot like an icepack. 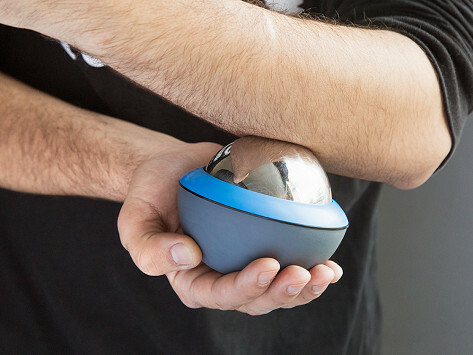 Inside the rolling sphere is a non-toxic gel that can stay cold up to six hours after a night in the freezer. Cold therapy reduces your metabolic rate and the release of lactic acid that causes your muscles to ache. After a workout, relieve strain or inflammation by massaging the roller over your muscles. Free roll it or place it in the specially designed rubber grip so your hand doesn’t get cold. Maker and athlete Matt Hyder was trying to ease his own post-workout ache when he came up with the idea for Recoup Fitness. It’s a combination of the methods he already knew worked. Now you can soothe your sore muscles and enhance your recovery routine right at home.